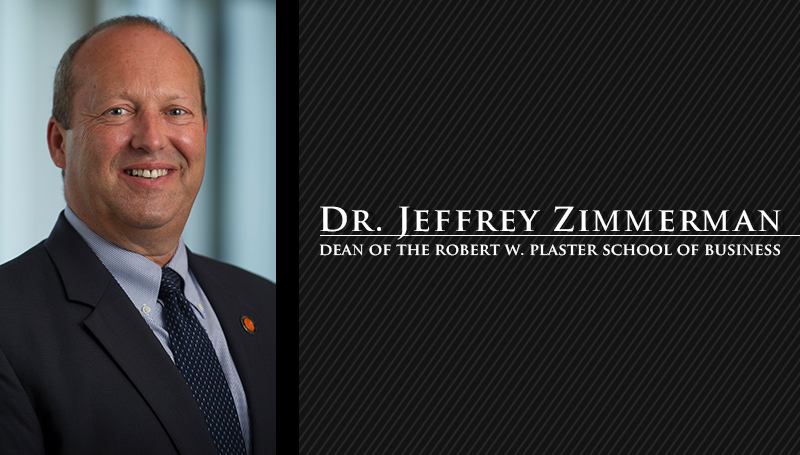 Dr. Jeffrey Zimmerman, who most recently served as a professor of economics and finance in the College of Business at Indiana Tech in Fort Wayne, Ind., has accepted the position of dean of the Plaster School of Business. He will begin his duties at Missouri Southern on July 1, succeeding Dr. Chris Moos, who has served as the interim dean for the last year. Zimmerman received his bachelor’s in computer science and economics from State University of New York at Albany in 1984, and a master of art’s degree in economics from West Virginia University in 1986. He obtained his master’s of science in economics from Purdue University in 1988, and his Ph.D. in economics three years later. His professional experience includes serving as an assistant professor of economics at the University of New Hampshire from 1990-91 and at Ithaca College from 1991-92, and from 1992-94 at Clarkson University in Potsdam, N.Y.
Zimmerman served at Methodist University in Fayetteville, N.C., from 1996-2011, both in the classroom and as dean of the Reeves School of Business & Economics from 2004-11. He served as dean of the College of Business at Indiana Tech from 2011-16.